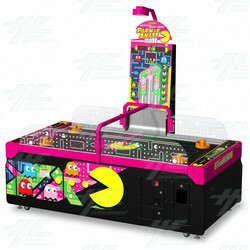 PacMan Smash Mini, whist a smaller and more affordable version of the Pac-Man Smash air hockey table, still offers a frantic battle of the pucks that will leave players wanting to play more. <b>How to Play:</b> The game starts begins with one regular sized puck and then at random times during the game, dozens of mini pucks will spill out onto the playfield causing a chaotic scoring frenzy. The game starts begins with one regular sized puck and then at random times during the game, dozens of mini pucks will spill out onto the playfield causing a chaotic scoring frenzy.